I’m putting together a spreadsheet of mods that I’ve found to send to Barry. 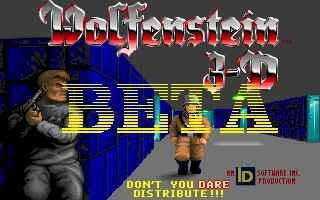 I looked at http://www.wolfenstein3d.co.uk/adds_VWX.htm#wolfshar for The Wolfenstein 3D shareware alpha, v1.0, v1.1, v1.2, v1.4, SDL, & Spear SDL. I can’t find the DOS Spear of Destiny shareware at http://www.wolfenstein3d.co.uk/adds_STU2.htm#spearshar or http://web.archive.org/web/20141022131336/http://www.3drealms.com/downloads.html . Can somebody please link to The DOS Spear of Destiny shareware? I might use it for a 2-level project. Thank you. Your first link doesn't have the installer. The second link is to a zip of a slightly different size that includes that installer. There is a v1.4 of the demo as well. I'll post a link to it here if I find it. If it's in an Abandonware site, I'll just have to download it and provide a temporary link until it finds a more permanent (and legal) home. Did you end up finding one Tricob? Thank you for following up on this. No, the link I thought was to v1.4 was in fact still v1.0. I did about a half-hour search for the version elsewhere, but I didn't find anything except v1.0. But I will post a proper link if I unveil v1.4 somewhere.